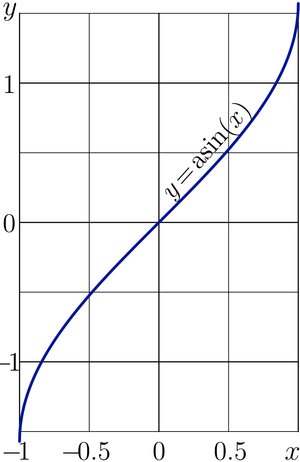 ArcSin, or asign, or arcsin is holomorphic function, inverse of sin. ArcSin is considered as elementary function. 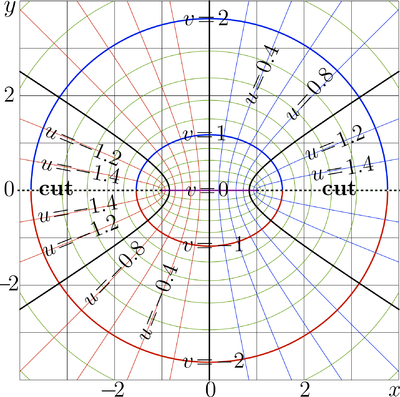 is holomorphic in the whole complex plane except the halflines and . Complex map or is shown in figure at right in the , plane with levels and levels . Thick lines correspond to the Integer values. The cut lines are shown with dashed lines. In vicinity of the cut lines, the real part of ArcSin approach values . While , id est, along the real axis, has real values. The graphic is plotted in figure at right. where I denotes the imaginary unity; Re and Im denote the real and imaginary parts; M_PI denotes . Fortunately, in the C++ compilers, function log is already implemented for complex double argument. This implementation above used to plot the complex map of ArcSin at the top figure. In particular, the same representation can be used for real values of the argument; the explicit plot of ArcSin is generated with the same representation. (Click the figure to see the code used for its generation.) However, the last graphic could be generated also with the internal C++ function asin of real argument, as well as with flipping of plot of function sin. arcsin(z) = z + 0.166666666666667 z3 + 0.0750000000000000 z5 + 0.0446428571428571 z7 + 0.0303819444444444 z9 + 0.0223721590909091 z11 + 0.0173527644230769 z13 + 0.0139648437500000 z15 + 0.0115518008961397 z17 + 0.00976160952919408 z19 + 0.00839033580961682 z21 + 0.00731252587359885 z23 + 0.00644721031188965 z25 + .. This page was last modified 15:07, 2 December 2013.